Mike Nelson, More Things (To the memory of Honore de Balzac), 2013. Installation photograph by Carolyn Thompson. 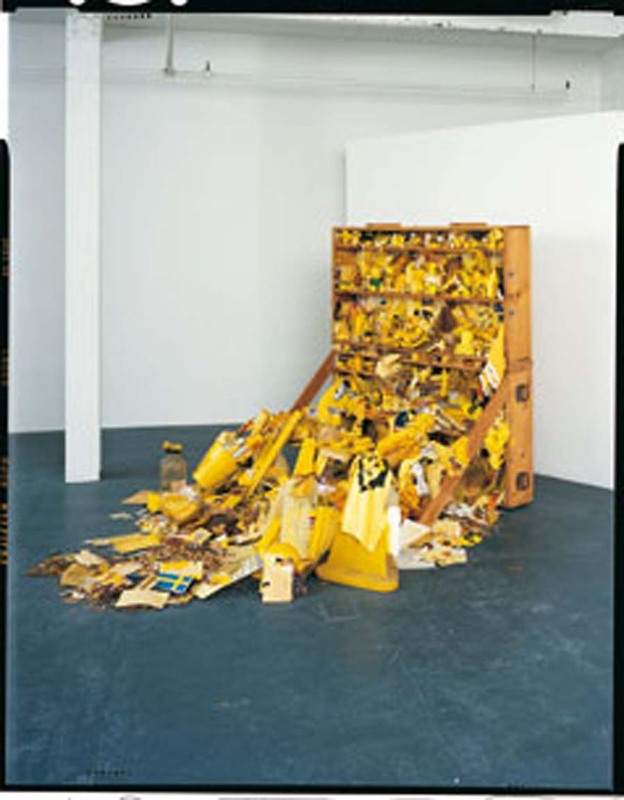 Robin Klassnik, Yellow Postal Sculpture, 1973. Installation view. 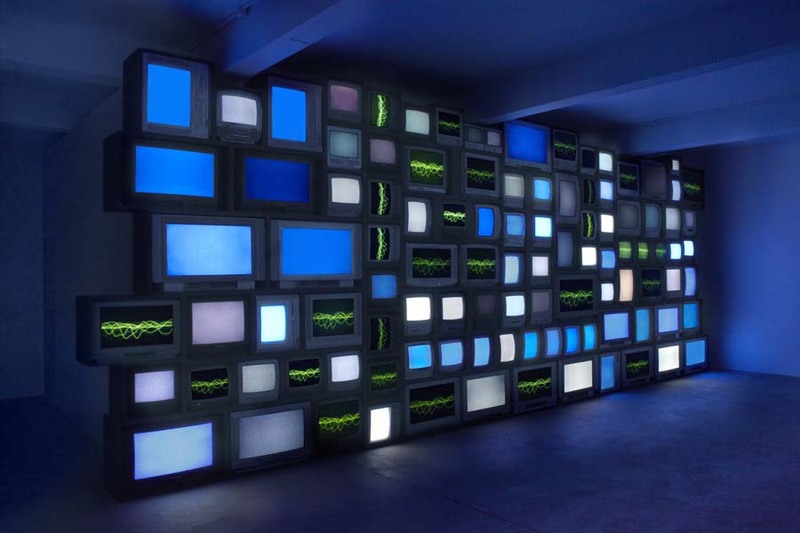 Channels, Susan Hiller’s fourth exhibition at Matt’s Gallery, is a vast audio-sculptural installation in which disembodied voices report on ‘near-death’ experiences. 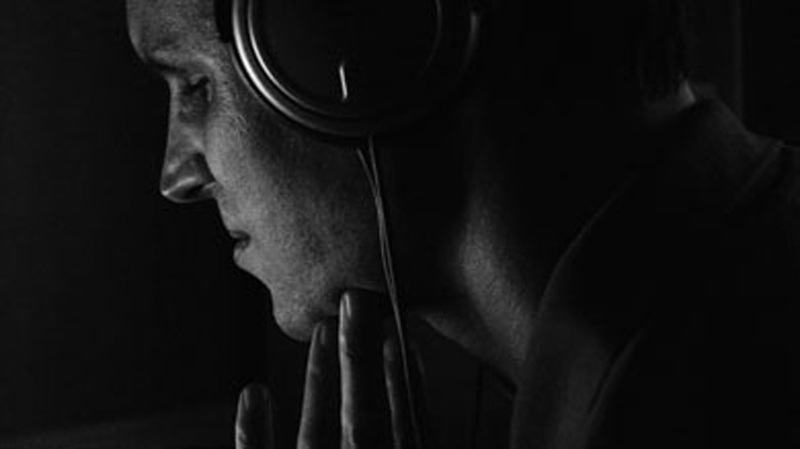 Hiller uses audio accounts in many languages from people who believe they have experienced death as the raw materials for her new work. Vivid stories of those who believe they have died and returned to tell the tale constitute a remarkable contemporary archive, whether the accounts are regarded as metaphors, misperceptions, myths, delusions or truth. For his fourth show at the gallery Mike Nelson has chosen to eradicate the constructed architecture that has formed the prevailing structures of his previous three Matt’s Gallery commissions: Trading Station Alpha CMa in 1996, The Coral Reef in 2000 and AMNESIAC SHRINE or Double coop displacement in 2006. Nelson returns to the right hand space where he constructed his first two works for the gallery, and has elected to replace those architectural constructs, that were built to hold and direct their audience, with sculptural entities. Gone are the spatial divides that existed in varying forms before, presenting us instead with an exhibition of objects, constructed on site with the most rudimentary materials. 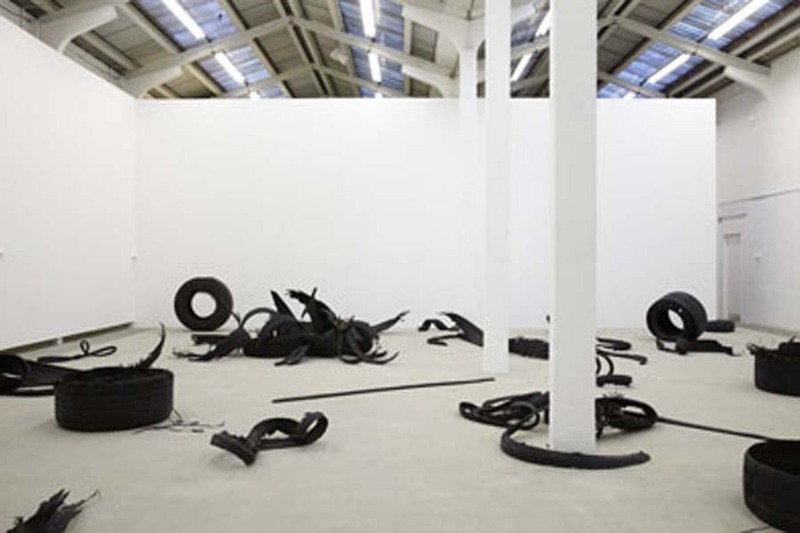 Mike Nelson, M6, Eastside Projects, Birmingham, until 9 March 2013. Mike Nelson, M6, 2013. Installation view at Eastside Projects. Photograph by Stuart Whipps. Courtesy of Eastside Projects. Eastside Projects presents M6 a new commission by Mike Nelson. M6 is Nelson’s first major exhibition in his home region and continues his singular investigation of political histories through the raw materials of our world. Within the old industrial heart of Birmingham, discarded, utilitarian objects have been collected as if they were trophies of an ignored parallel world. A dark, abject monument – it acts as an invocation of the highways, and their concrete islands memorialising their past production and the shifting economies of spent resources. Hayley Newman, Volcano Lady, 2007. From the Matt’s Gallery Print Portfolio E3 4RR. This exhibition presents nearly 200 works from the Government Art Collection, including works by Mike Nelson and Hayley Newman from the Matt’s Gallery Print Portfolio, E3 4RR. For more information on the print portfolio, please click here. Fiona Crisp, Norwegian Series No. 3, 2007. From the Matt’s Gallery Print Portfolio E3 4RR. This thematic collection display looks at continuities in the way artists have framed our vision of the landscape over the last 300 years. Coinciding with the re-opening of all Tate Britain’s galleries, the selection finds surprising coincidences and remarkable affinities in the way we look at the view, whether near or afar, high or low, from inside or out. 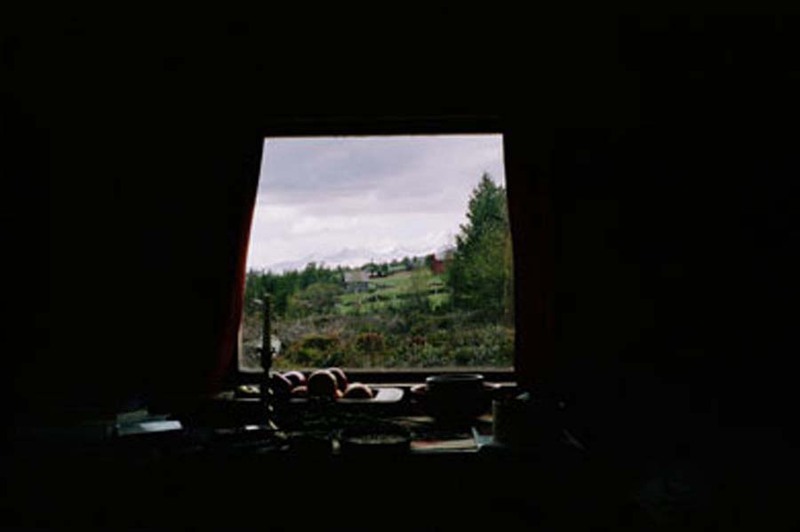 The exhibition includes Ghost Story by Willie Doherty and Norwegian Series #3 by Fiona Crisp. Willie Doherty’s Secretion, originally commissioned for and exhibited at dOCUMENTA (13) is on show at Statens Museum for Kunst. In this video slow camerawork zooms in on fragments of a secluded landscape as well as an abandoned building at the edge of civilization.The beautiful and sharp shots of fungus attacks, rot and decay create contradictory visuals that permeate this at once compelling and terrifying work. 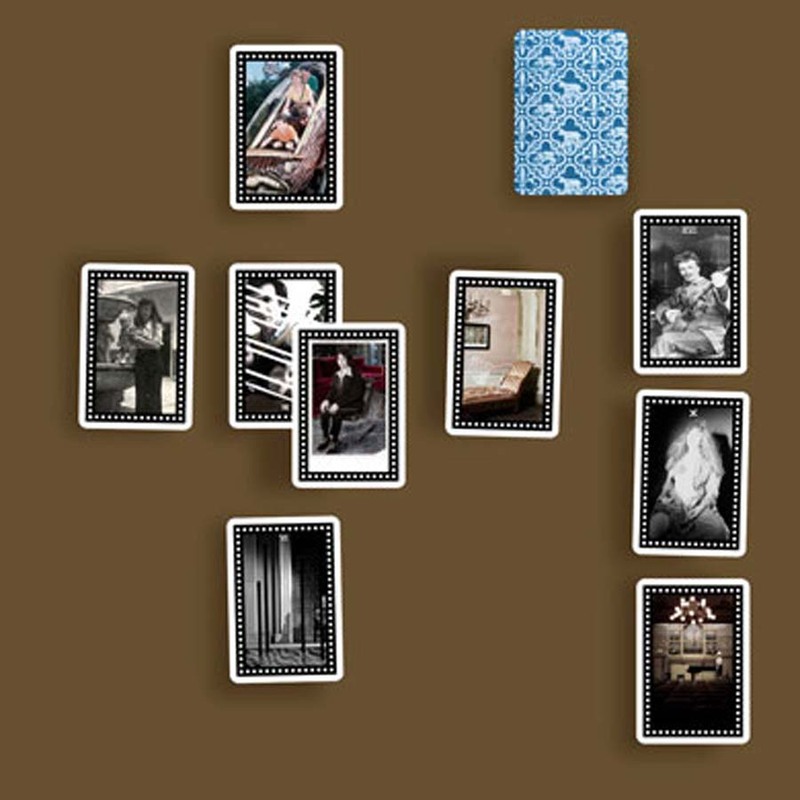 Lindsay Seers, Mock up for It has to be this way (Tarot), 2012. The Book Lovers is a systematic attempt to study the phenomenon of artist novels. An investigation of the creative consequences when artists choose the novel as a medium is the core of this long-term project and research. For an increasing number of artists, the novel is becoming a means to generate new art objects in the scope of a multidisciplinary practice. 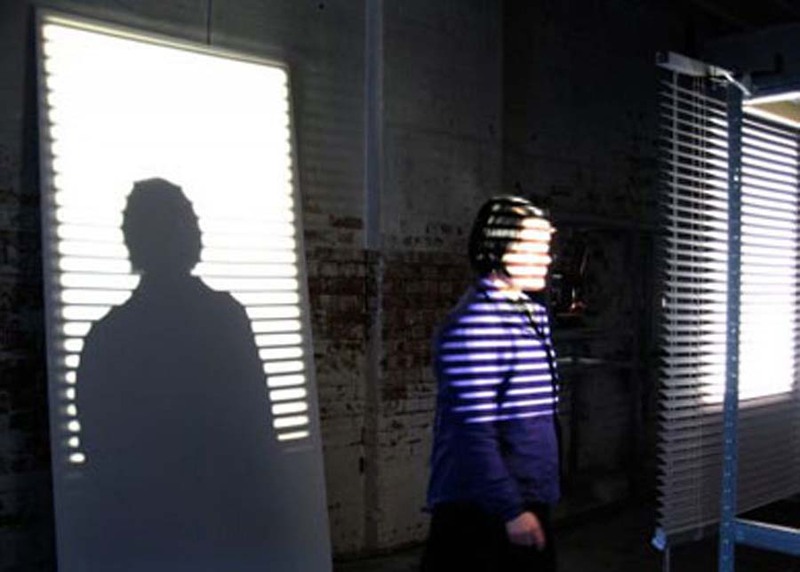 Participating artists include Alexandre Singh, Liam Gillick and Lindsay Seers. 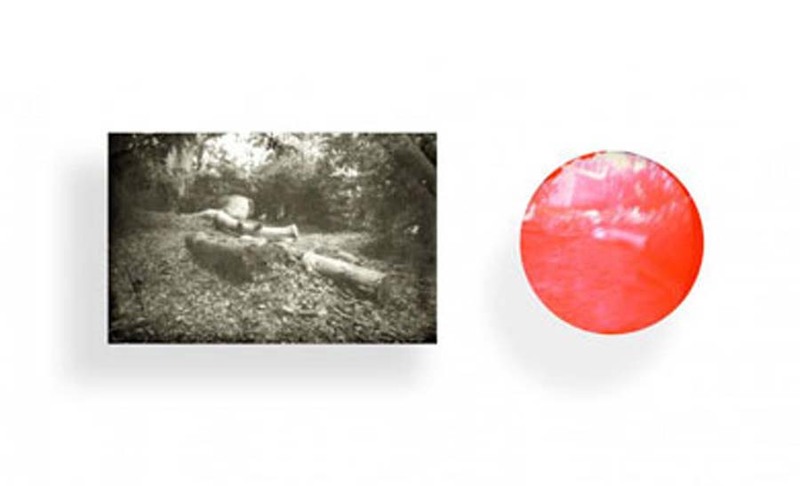 Lindsay Seers, Backlands, 2004/2010. Photograph with mouth photograph counterpart. 400 x 250 x 65mm. 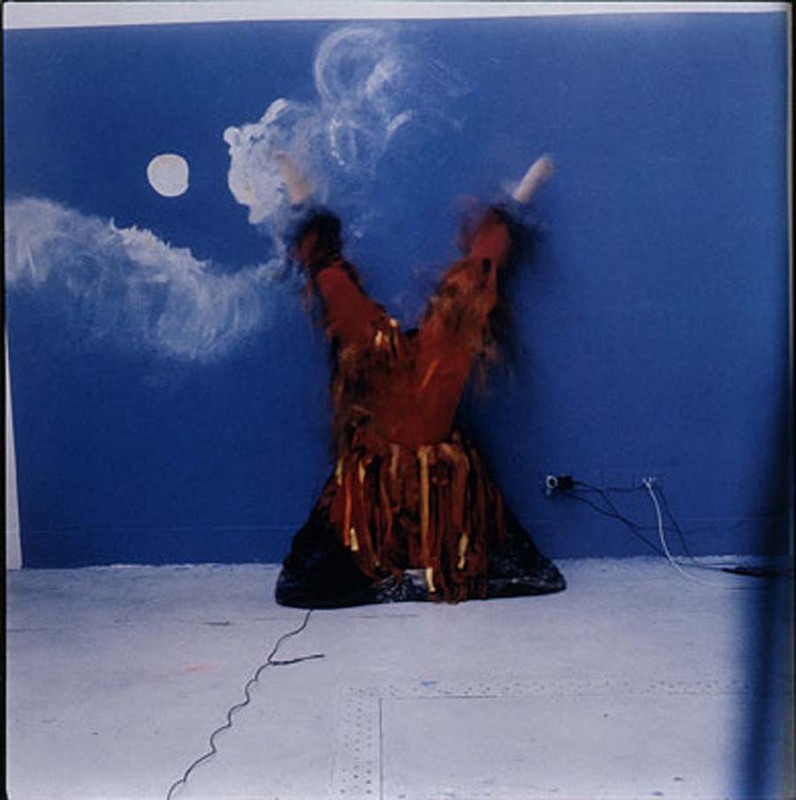 This group exhibition curated by Steffi Klenz includes a number of Lindsay Seers’ Optogram works, which use the contact of the original piece of photo paper that was put in the artist’s mouth to capture an image. 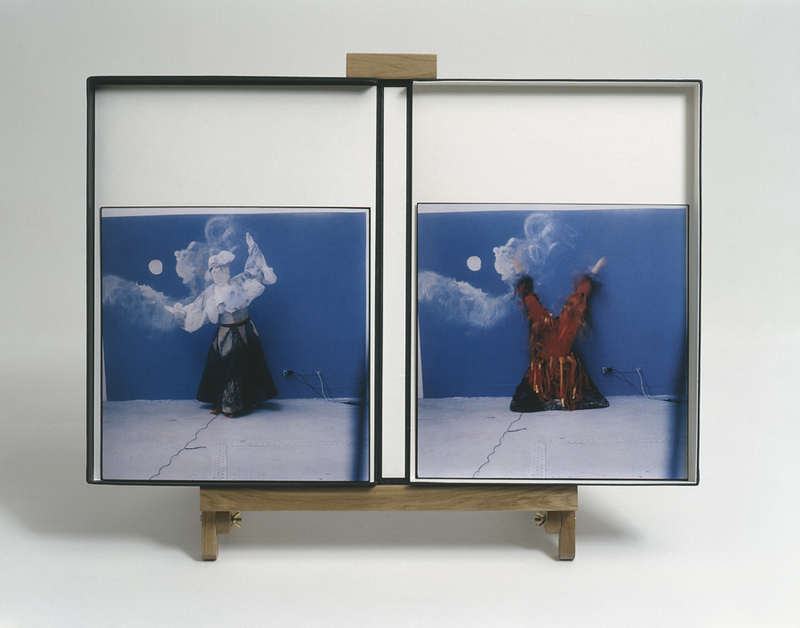 Lindsay Seers, Extramission 6 (Black Maria), 2009. Installation view at Tate Britain. Tate Collection, London. This group exhibition investigates the nature of documentarism in different media – from object works to cinematic narrative. The works exhibited reuse and reinterpret documents, pushing the envelope of the concept of documentarism. The show includes Lindsay Seers’ Extramission 6 (Black Maria), 2009. Emma Hart, Monument to the Unsaved #2 (M20 Death Drives with Imagination Products), 2012. Detail of installation. Commissioned by Whitstable Biennial. Emma Hart’s mixed media video work Monument to the Unsaved #2 (M20 Death Drives with Imagination Products), commissioned for the Whitstable Biennial, forms this solo show at Art Exchange in Colchester. Emma Hart, ceramic in progress, study for new ceramic and photographic work, 2013. This exhibition brings together new works made by artists who were in-residence at Wysing in 2012, as well as material that has informed its making. 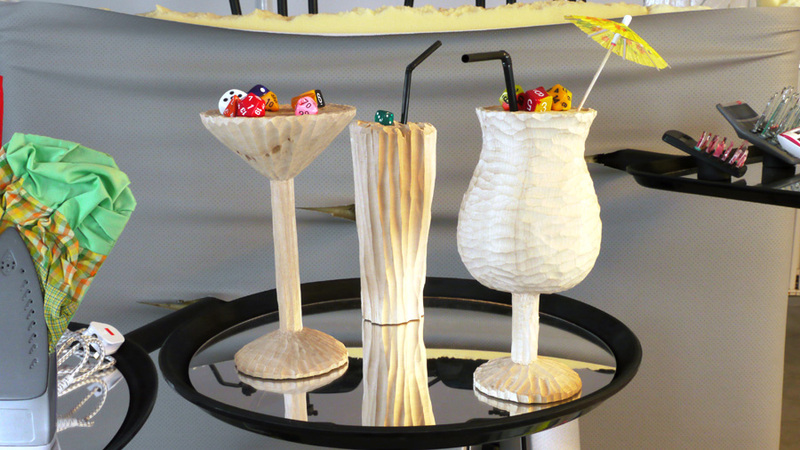 The exhibition includes work by artists including Ed Atkins, Jess Flood-Paddock, Emma Hart and Elizabeth Price. Emma Hart, Blind, 2006. Installation view. 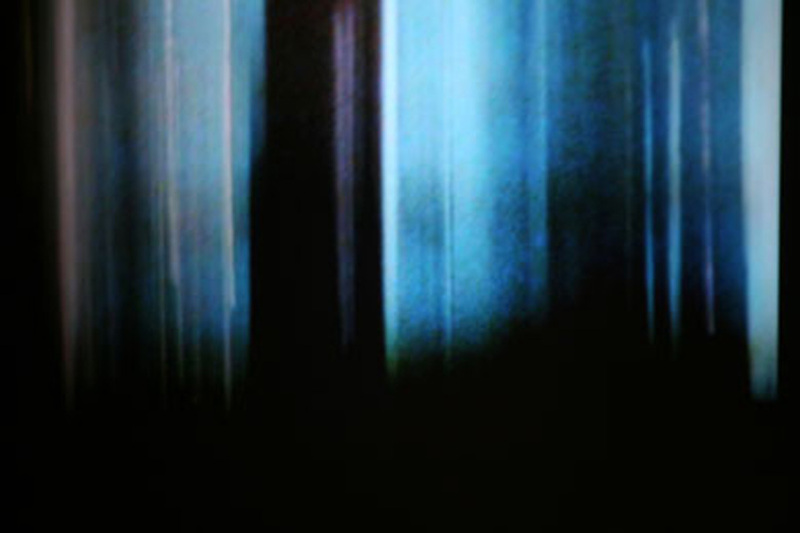 Film in Space is a group exhibition selected by British artist-filmmaker Guy Sherwin. The exhibition focuses on expanded cinema, a film movement which came to prominence in Britain in the early 1970s, at the time Sherwin started making films. For Camden Arts Centre he has selected a number of key works from this period and is showing them along with works by younger artists who are continuing to experiment with the versatility of analogue media, as well as others who have started to take onboard the advent of digital technologies. 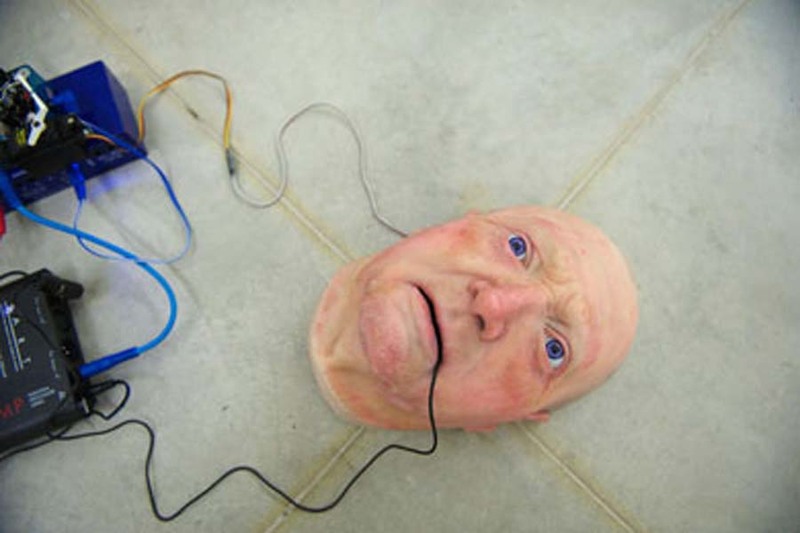 Nathaniel Mellors, The Seven Ages of Britain Teaser Face, 2010. Installation view at Monitor, Rome. This group exhibition explores the clear boundaries between life and death which are fading due to rapid developments in the biosciences. The participating artists raise existential questions. Is death inevitable? Is there life after death? What is the value of artificial life? They are taking control of evolution: like modern alchemists. Jordan Baseman, Nasty Piece of Stuff, 2009. Film still. 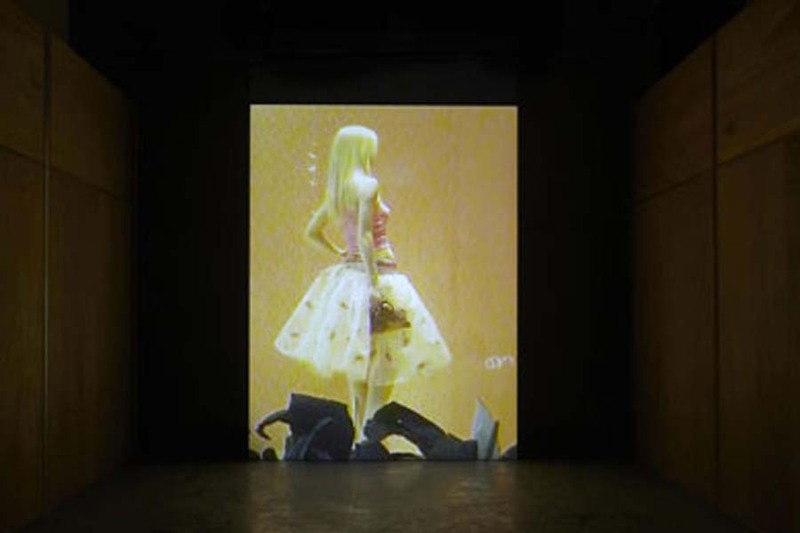 This group exhibition, curated by Jordan Baseman and Gary Thomas, an exhibition of artists’ films that employ animation techniques as part of contemporary practice. The exhibition includes Baseman’s Nasty Piece of Stuff, and Nathaniel Mellors’ Jailbreak, from his first exhibition at Matt’s Gallery. The exhibition will later tour to Monash University Museum of Art, Melbourne, Australia; and The British School at Rome, Italy. Jordan Baseman, Green Lady, 2011. Film still. Jordan Baseman’s film Green Lady will be screened as part of Fargo Film Festival, and has been awarded Best Experimental Film at the festival. Jordan Baseman’s film Nasty Piece of Stuff will be shown as part of this year’s Berlin Independent Film Festival. This solo exhibition presents Imogen Stidworthy’s video work Sacha and Scan which originally formed part of the exhibition (.) at Matt’s Gallery in 2011. How To Tell A Story addresses storytelling as discipline that moved from marketing strategies to political discourses to enter the whole news/media system. 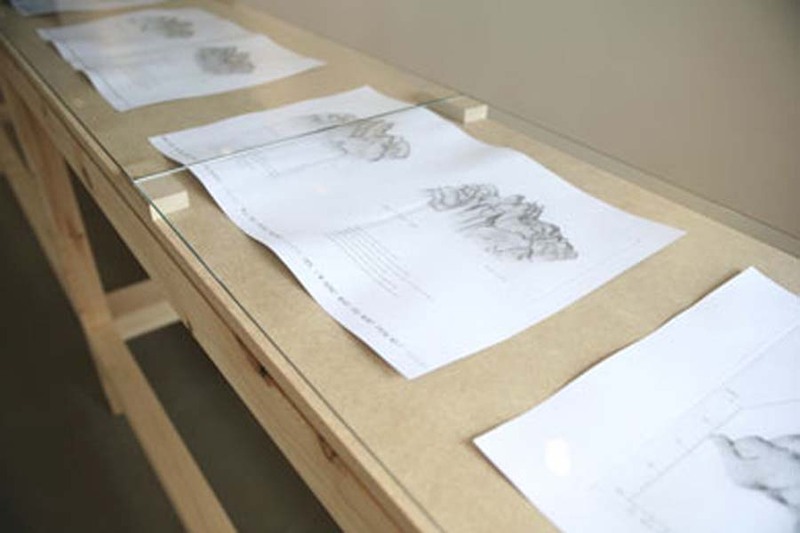 The exhibition includes Imogen Stidworthy’s print work Topography of a Voice. Imogen Stidworthy, The Work Vo3, 2011. 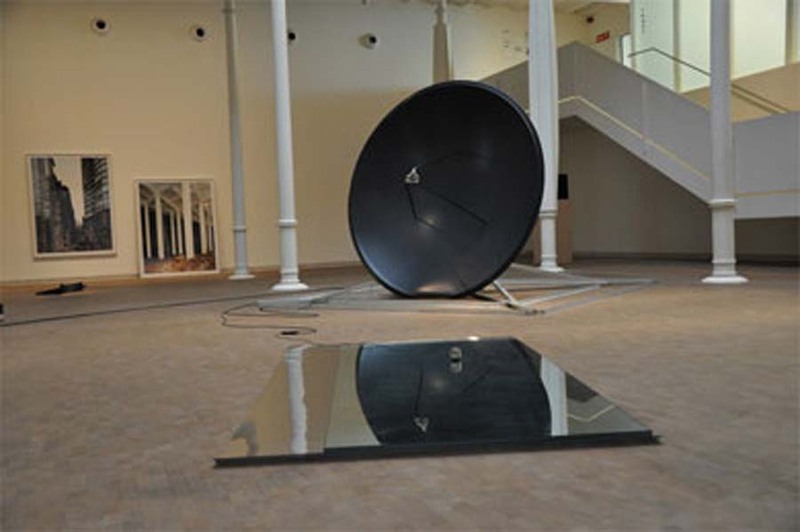 Installation view at Fundacio Tapies, Barcelona. 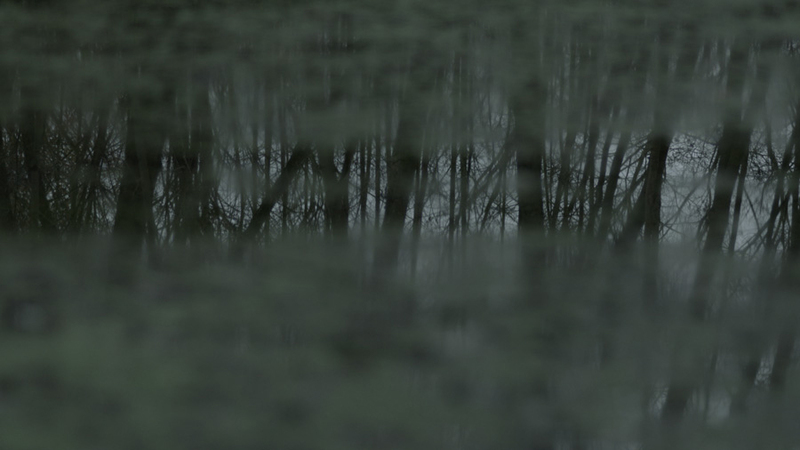 The inaugural exhibition at Casa del Lector, Madrid will include Imogen Stidworthy’s The work v03, 2011. Benedict Drew, The Concha Institute, 2013. Video still. 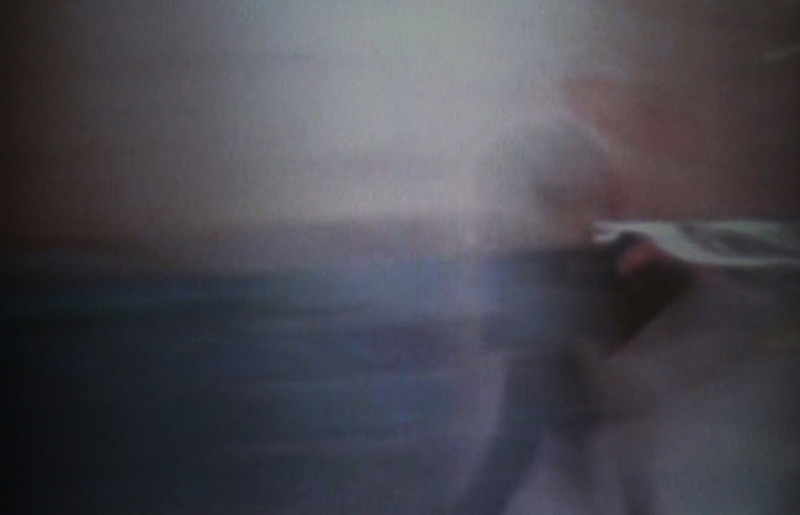 This screening programme curated by Elinor Morgan shows a selection of moving image works by six UK-based artists. Each of them approaches the process of making film or video works in a different way but common threads run through the programme: the production of digital realms, film as a space in which sculptural forms can be presented and the impact that the internet has had on the way that we interact with information, imagery, one another. 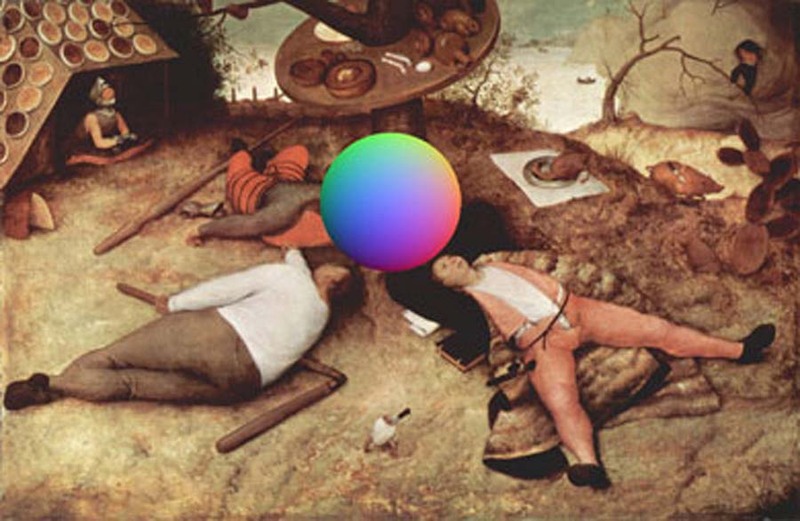 Many of the works presented use the internet as source material, a tool for production, or content and all have a relationship to developments in digital technology. 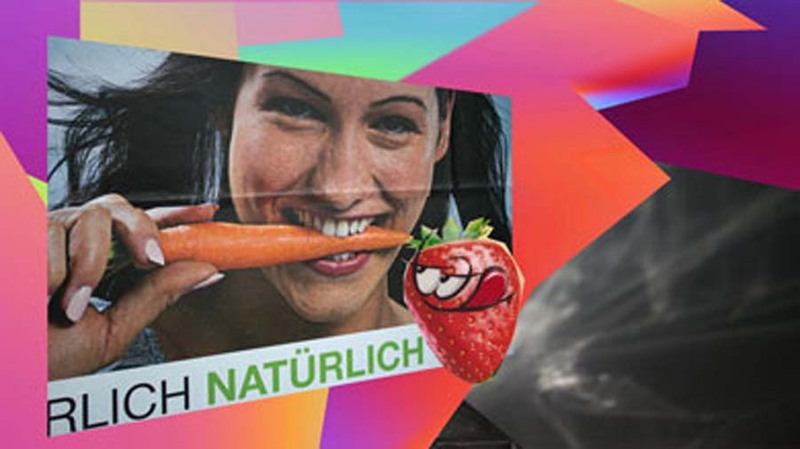 Melanie Jackson, Urpflanze Part 2, 2012. Still. Commissioned by The Arts Catalyst. Transformism features new commissions by two artists, Melanie Jackson and Revital Cohen. The Urpflanze (Part 2) is the second part of Melanie Jackson’s ongoing investigation into mutability and transformation that takes its lead from Goethe’s concept of an imaginary primal plant, the Urpflanze, that contained coiled up within it the potential to unfurl all possible future forms. Melanie Jackson, Urpflanze Part 2, 2012. Commissioned by The Arts Catalyst. Melanie Jackson will be artist in residence at the university of Bristol Stoke Bishop site in conjunction with Field Art Projects to produce events, performance and new work from spring to autumn 2013. 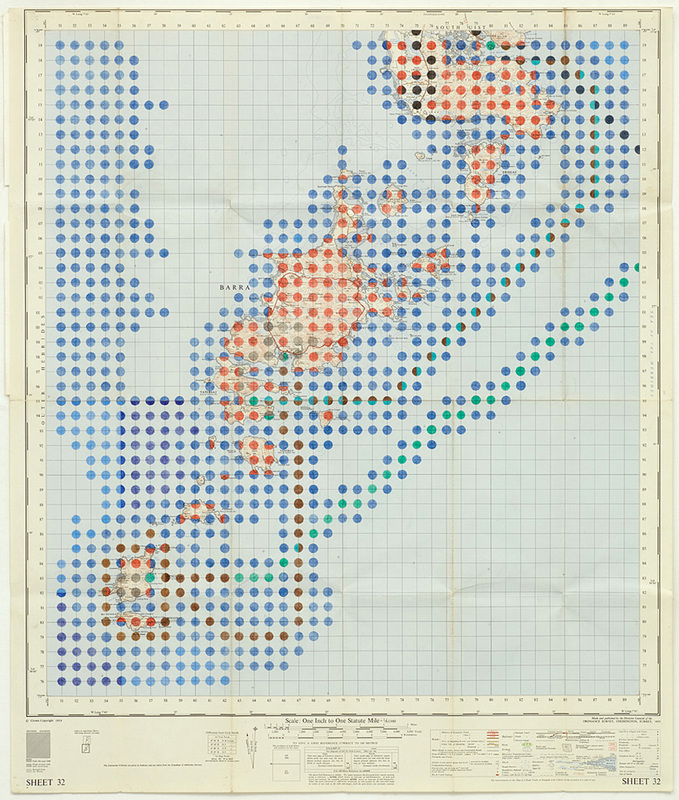 Alison Turnbull, We Crossed the Minch, 2011. Graphite and coloured pencil on Ordinance Survey map. This exhibition, curated by Deanna Petherbridge, will include several new and existing works by Alison Turnbull. 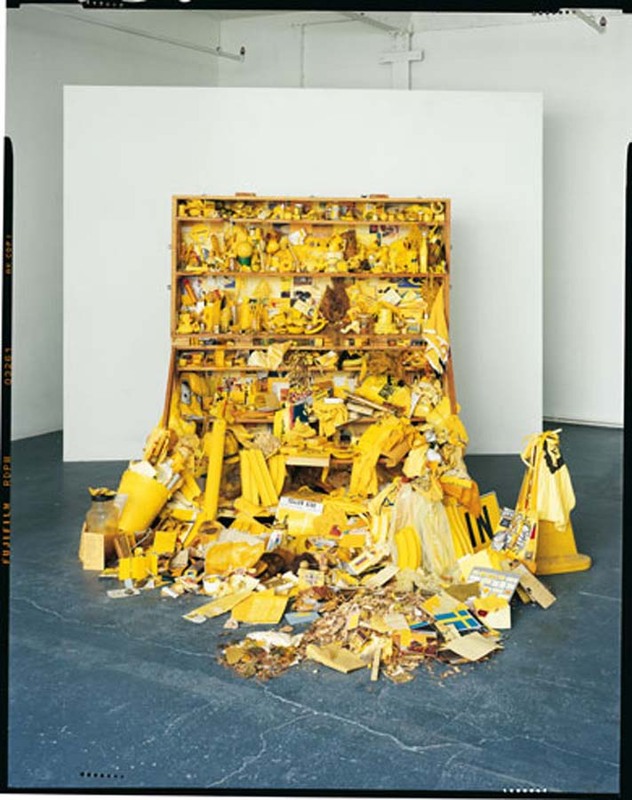 Robin Klassnik, Yellow Postal Sculpture, 1973. Robin Klassnik’s work Yellow Postal Sculpture will be shown in Poland as part of an exhibition curated by Boena Czubak and Jaroslaw Kozowski. This work was originally shown at Kozowski’s Galeria Akumulatory 2, Pozna in 1975. Hayley Newman, Volcano Lady (detail), 2007. From the Matt’s Gallery Print Portfolio E3 4RR. Castlefield Gallery presents its annual Head to Head exhibition featuring new work by Hayley Newman and Emily Speed, exploring the relationship between the body and architecture. 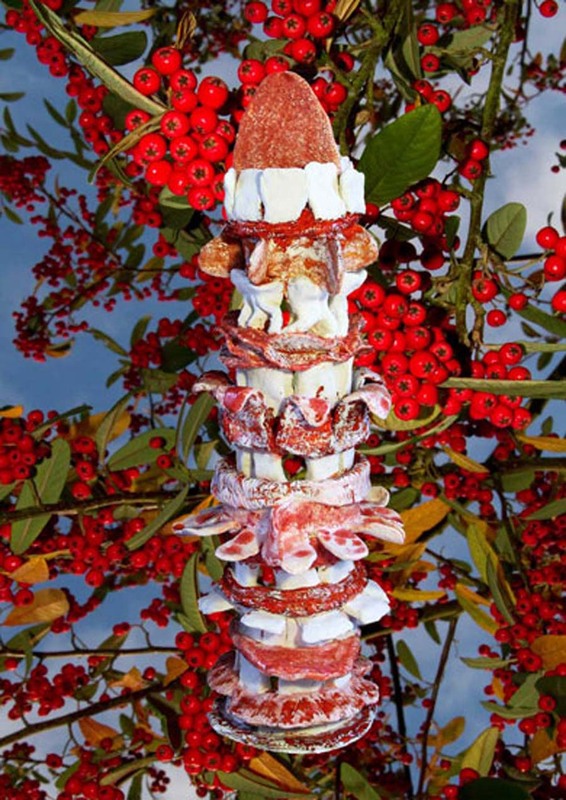 The exhibition will include Newman’s key 2004-2006 work The Volcano Lady; and the new work Domestique consisting of over fifty donated used dishcloths with embroidered faces, made using ribbons, sequins, pearls, embroidery silks and buttons. 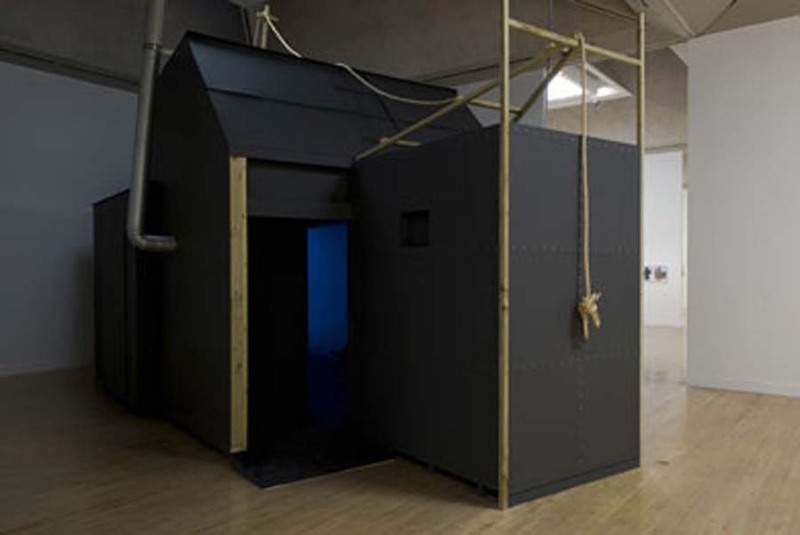 This group exhibition includes Susan Hiller’s The Last Silent Movie, shown at Matt’s Gallery in 2008. Other participating artists include Jeremy Millar and Darren Almond. Rachel Lowe, Revolving Woman, 2008. Installation view at Eastside Projects. Photograph by Stuart Whipps. Courtesy of Eastside Projects. Following on from Revolver Part 3 at Matt’s Gallery, Rachel Lowe’s large scale video work Revolving Woman is on exhibition at Eastside Projects.